Dramatically rise up in organic search results following a content marketing approach. Available in 12 languages. Available in 12 languages for Kindle. English language available at this time. English language. Perfect for the busy entrepenuer. 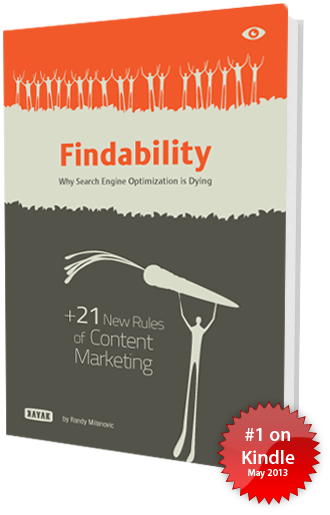 Get Findability: Why Search Engine Optimization is Dying + 21 New Rules of Content Marketing. Are you ready for the new world of search engine optimization, social media, and content marketing? You had better be, because Google, Facebook, Twitter, and other popular Internet marketing tools are changing fast... the companies that adapt are going to find more opportunities, while their competitors are going to be left behind. Why traditional search engine optimization is dying... and what Google has planned next. The best ways to appeal to search engines, social media sites, and customers at the same time. One mistake that kills 95% of the marketing content you see, and how to avoid it. The 21 new rules of content marketing that businesses of all sizes use effectively and affordably. An interesting take on the future of search engine optimization. It's handy and useful as an easy source of ideas - anyone who writes for the web will find something new to try. My favourite? "Treat Keywords Like Hot Sauce" This book is an easy read and something I'll be referring to from time to time when I'm short on ideas. Inside a week it's already made a difference. I don't know who this Randy Milanovic guy is, but he sure nailed it! Very succinct, and helpful in laying out the big picture for content creators and managers like me. This was a few bucks - and a few hours - very well spent! Awesome eBook Randy! The current online marketing landscape is definitely changing and this eBook will help companies navigate the new online waters. It's jam packed with valuable information not only for improving SEO and content marketing but for developing an effective online strategy as a whole. A must read for online marketers & companies who are interested in honest & helpful content marketing tips. Thanks for the read. Cheers!